The United States Institute for Peace has just released a briefing entitled "Iraq in the Obama Administration" drafted by Daniel Serwer and Sam Parker. The report reflects a series of discussions by USIP's genuinely bipartisan Iraq group, a legacy of the Iraq Study Group (keeping in mind that "those whose names are listed at the end have participated one way or another in the discussions on which the paper is based, but do not necessarily agree with it in its entirety"). The report focuses on the need to pay careful attention to Iraq during the transition period and early months of the administration, a time when issues might be expected to fall between the cracks. I am not going to present the whole report here -- I agree with much but not all of it, and would have preferred some other points be more central, but I recommend that those interested in Iraq policy have a look at it. Some of its recommendations can't wait for the new team to mull over -- such as the urgent need to quickly fill the key policy positions, including Ambassador, or the need to be prepared for the provincial elections scheduled less than two weeks after the inauguration. Others will hopefully help prepare decision-makers for some important issues inevitably coming down the pike. The President-elect has an opportunity to reconfigure the U.S./Iraq relationship, relying in part on the SOFA. The Bush Administration gave Prime Minister Maliki largely unconditional support from 2006 onwards, because the future of the political process was in doubt and the overarching priority was for the government to stand up and fill the security and governance void. Maliki became increasingly confident that there was no alternative for the U.S. but to support him. Cooperation with international efforts to fight terrorism. This approach is not intended to restore U.S. influence, which inevitably will continue to decline, but rather to use the influence that remains most effectively in the pursuit of a future stable Iraq that meets U.S. interests, which are broadly consistent with the political objectives that the Iraqi parliament adopted when calling for a referendum on the SOFA. This meeting [with the Iraqi Presidency Council] should launch an on-going strategic dialogue through the Higher Coordinating Committee created in the Strategic Framework Agreement. President Obama should tell Iraqis clearly of his intent to withdraw U.S. combat forces faster than the SOFA requires, subject to adequate progress on political and security matters. As Vice President-elect Biden is strongly associated in Iraqi minds with proposals to partition Iraq, which are vigorously opposed in the Arab population, it will be important to clarify that this is not Obama Administration policy (based on the campaign statements of the president-elect). Let me put on my public diplomacy hat for a moment. Right now, in the absence of clear statements from a President-elect wisely determined to adhere to the 'one President at a time' rule, anxious Iraqis and Arabs, the American media, and those hoping to pre-emptively shape the new administration's policy are filling the void with a wild range of theories, projections, and suspicions. Contradictory comments from Gen. Ray Odierno and Iraqi government spokesman Ali al-Dabbagh have fueled these suspicions. A whole lot of Iraqis seem to think that the Biden Plan to partition Iraq is coming back or that there are secret riders to the SOFA/WA allowing permanent U.S. bases or that Obama has "abandoned" his commitment to withdraw from Iraq, to mention only three that I hear a lot. I believe that there is very little basis for most of what's circulating (in the U.S. or in Iraq) but in a sense that's the point -- that's what happens in the absence of good information. This is a good example of where public diplomacy and foreign policy come together -- by listening to what Iraqis are saying, and moving quickly and judiciously to respond to those concerns, the administration might be able to pre-empt the emergence of unnecessary problems. Lord knows there will be enough real problems -- why add on popular fears of, say, the Biden Plan if there's nothing to it? Most policy types probably wouldn't see the point of denying the partition stories because nobody in the U.S. is really talking about it... but the fact that Iraqis are should be reason enough to take it on. The new administration could save itself a lot of headaches down the road by addressing these fears and suspicions (and hopes) head on, saying clearly what is and is not the new administration's policy and then living up to it in practice. I'm not just talking about words, though. Words must be matched by deeds to be credible. Statements should be backed up with clear, strong, "costly signals" that demonstrate the seriousness of the public commitment to withdrawal, to Iraqi territorial unity, to respecting the terms of the SOFA (I expect an early challenge on the immunities question, for instance, probably with an arrest of some kind for which the new administration had best be well-prepared). Another example: I continue to argue that Obama should announce early, significant troop withdrawals in spite of the powerful internal pressures to postpone them. Early withdrawals would take advantage of the transition's unique, single opportunity to reshape the foundations of America's role in Iraq. They would demonstrate -- to Iraqis, Arabs, Iranians, and Americans alike -- that policy is really changing. They would force Iraqis to make the painful accommodations avoided for so long (particularly since the Political Reform Agreement passed alongside the SOFA/WA by the Iraqi Parliament lays out a remarkably comprehensive pathway to such political accord). They would likely help win Iraqi support for the SOFA/WA in the upcoming referendum. And, though this is less important to me, they would likely be politically popular at home. But above all, to get back to the original point, such costly, public steps would build credibility and go a long way towards reassuring skeptics and thus have a positive effect across a whole range of other related issues. Anyway, enough about my own issues. Let me just again direct attention to Parker and Serwer's USIP report which will likely be only the first of many such reports to drop in the next couple of months. The Project on International Policy Attitudes just released an intriguing result from its multi-national surveys of international public opinion: outside of the United States, there isn't a lot of support for U.S. bases in the Gulf. As the above chart shows, 70% of Americans think that bases in the Gulf are a fine idea. The UK and France are roughly evenly split (43-39 and 41-43, respectively), but 52% of Germans are opposed. Only 4% of Russians and 8% of Chinese approve -- ah, the smell of great power politics in the air. And then you get to the Arab and Muslim world: 11% of Jordanians approve, 6% of Turks, 4% of Palestinians, 5% of Indonesians, and a statistically insignificant number of Egyptians. A pity they didn't (couldn't?) ask the question in the Gulf itself... would be interesting to hear what the Kuwaitis, Qataris, Bahrainis -- or Iraqis -- in question have said about their "protectors". Even allowing for the problems with such opinion surveys, these numbers should be sobering -- especially as they track with lots of other surveys about regional views of American foreign policy. Americans generally believe that their military presence in the Gulf represents an "international public good", protecting energy supplies and global stability, and consider their military hegemony to be cushioned by "soft power" through which American leadership is perceived as benevolent and desirable. Most of the world's publics, especially Arab and Muslim publics, don't seem to agree. Public diplomacy -- and grand strategy -- need to take such findings a bit more seriously. UPDATE: Spencer Ackerman asks WorldPublicOpinion.org why they didn't survey the Gulf - check out the answer. Regarding his question about who else will guard the shipping lanes, well, India and Qatar did just sign that big security cooperation deal. Not that I think the changing of the guard will (or should) happen any time soon, but a lot of those Gulf countries do seem to be looking East towards the big energy markets lately... and historically speaking, great powers do seem to have a way of seeing the need to protect their interests abroad. TWO MORE UPDATES: Right on cue, "A vice foreign minister and a leading naval strategist were quoted in Chinese state media on Wednesday as saying that Beijing was close to mounting a naval mission in the gulf." Great powers, state interests, and all that. Meanwhile, Jon Alterman reads the NIC's Global Trends 2025 report and concludes (no idea how to find a direct link, sorry, but will add when one appears) that Gulf leaders reading the tea leaves are likely to conclude that "the United States sees their region become far less central to global security than it is now... [which] indicates a far weaker U.S. security commitment to the Gulf come 2025. Put bluntly, the report suggests that over the next two decades, the U.S. security commitment to the Gulf will shift from being a constant to a variable." He therefore expects Gulf leaders to rationally start looking around, "diversifying their strategic relationships" -- most likely with France, Russia, China, and India -- and seeking an accommodation with Iran. The Washington Post reports today that the Defense Department "will pay private U.S. contractors in Iraq up to $300 million over the next three years to produce news stories, entertainment programs and public service advertisements for the Iraqi media in an effort to "engage and inspire" the local population to support U.S. objectives and the Iraqi government." In contrast to earlier efforts, where there was supposedly always a "produced by MNF-I" label, these efforts explicitly will not have such attribution. As one official explains, "They don't know that the originator of the content is the U.S. government. If they did, they would never run anything." These sorts of efforts exemplify all of the problems with strategic communications vs public diplomacy at which I hinted on Tuesday. It's easy to see why eager information warriors think that paying for positive press makes sense in pursuit of tactical advantage in the strategic propaganda war. It gets the "messaging" out with greater credibility, it "counters" the adversaries efforts, and it might shift some perceptions in the short term. Even at this level, the strategy is deeply flawed. When the payments are exposed, as they inevitably are in today's global media environment (for example, with page one stories in the Washington Post), they then discredit not only the specific messages but also every other pro-U.S. message which will quite reasonably then be dismissed as "paid for by the United States." At our panel this week, Mike Doran and others suggested that the key to success in the "war of ideas" is building up credible third party messengers. Nothing could be more devastating to the credibility of third party messengers than this kind of program. At a deeper level, these efforts fatally compromise the long-term objective of building free, credible and independent media as the foundation of a democratic system. I've argued many times that support for free and independent media should be at the center of all efforts to promote reform in the region. Only a free and independent media can provide the flow of information, the transparency and demands for accountability, and the open contestation of political ideas necessary for real political pluralism and democracy. Turning the media into a tool for spreading propaganda compromises not only the very media which we should be promoting but also our own credibility in arguing for a free and independent media. The other obvious point is that current "war of ideas" and COIN thinking explicity considers U.S. public opinion an important domain of information warfare. The Post quotes from the contract solicitation this passage which should be deeply disturbing: one goal is to "communicate effectively with our strategic audiences (i.e. Iraqi, pan-Arabic, International, and U.S. audiences) to gain widespread acceptance of [U.S. and Iraqi government] core themes and messages." Presenting American audiences as a key target for manipulation through the covert dissemination of propaganda messages should be seen as scandalous, subversive of democracy, and illegal. Let's hope this story finally gets some attention to trends I've been tracking for years. 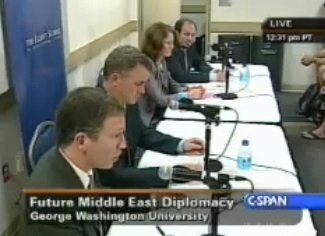 Tuesday's panel discussion which I organized for the Institute for Public Diplomacy (working title) and Institute for Middle East Studies at George Washington University, "Public Diplomacy and the War of Ideas: Agendas for the Next Administration," went extremely well. A standing room only crowd and live C-Span audience got to see an unusually substantive, thoughtful discussion of the bureaucratic, practical, policy and intellectual challenges facing the next administration - whichever it may be - in this vital policy area. I introduced the event by recounting the rise of "public diplomacy" from something of a niche State Department specialty to a matter of urgent national security and policy concern after 9/11. 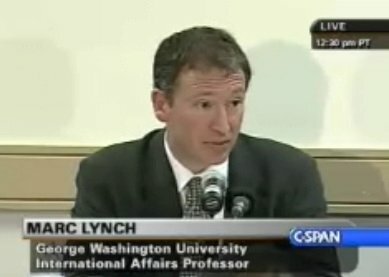 The perceived rise of anti-Americanism, the destructive power of al-Qaeda's ideology, and the 9/11 Commission Report's call for a "war of ideas" generated a remarkable number of reports (Hady Amr and Peter Singer counted 33 different major studies in a, yes, report that they wrote in 2006). It also helped spark major changes in U.S. foreign broadcasting (al-Hurra TV and Radio Sawa), the creation of the position of Under-Secretary of State for Public Diplomacy (currently held by Jim Glassman), and more. But what have we actually achieved through all of this effort? What specific goals have been advanced, problems solved, or interests advanced? I argued that the policy debate had been roughly framed around poles loosely definable as "public diplomacy" and "strategic communication." Public diplomacy advocates generally focused on promoting America's image in the world, building relationships with foreign elites through cultural programs and exchange programs, and generally working to explain America to the world. Strategic communications advocates generally focused on the use of information in the service of particular tactical or strategic objectives: delegitimating al-Qaeda's ideology and driving up its negatives. Both goals clearly have their place, but there has been a remarkable imbalance of resources devoted to each. Even Secretary of Defense Robert Gates has repeatedly noted the unhealthy implications of the vast gap between the resources available to the Pentagon and to the State Department, particularly in the realm of these public diplomacy/strategic communications issues. This imbalance has tipped even further with the embrace of strategic communications concepts by Glassman since taking over as Under-Secretary of State for Public Diplomacy. So with that context, I asked the three speakers to offer their visions of what the U.S. should do in the next administration. Take public diplomacy seriously: the world has changed in ways which make it more important than ever before. The spread of democracy, the rise of global communications and media, the power of ideas and ideologies - all of these force us to recognize the power of information and ideas, and the shaping of them which lies at the heart of PD. View public diplomacy more strategically. Too much of American public diplomacy has been reactive and tactical, asking public diplomacy officers to "sprinkle pixie dust" on policies determined in advance. Instead, foreign public attitudes should be taken into account during the process of forming policy - not to give foreign publics a veto, but to anticipate their reactions and find ways to shape their likely reception of U.S. policy initiatives in beneficial ways. View public diplomacy broadly. It should be an effective complement to every issue, not just on terrorism. Play offense and defense. Negative campaigning to shape the political arena definitely has its place. The U.S. government might not be the right messenger in these campaigns, so instead it should facilitate the efforts of like-minded individuals from the societies in question. Think about public diplomacy even when no specific goal is being pursued. American policies and perceptions should be explained constantly, routinely, in order to give foreign publics insight into our motivations and expectations. Promote understanding of America in all of its complexity and put our policies in context. Making America appealing or attractive would be nice, but is not necessary. We need to confront who we are. In a world where Arab teenagers ask about the latest controversy on the U.S. election campaign trail posted on YouTube, it's crazy for public diplomacy to try to shape or control America's image from the top down. We can't hide who we are. We need to be broad based in our engagement and messaging. The maxim that we should engage moderate or like-minded Arab allies is too limited - engaging the 1% of Arab liberals who already agree with us will not address our problems. While we should never be sitting down with or legitimizing those who use or promote violence, there is a broad range of religious conservatives and traditionalists who we can not afford to ignore. They are the 'swing vote' that we need to win. Think about two-way communication. Too much of what we do is one-way: broadcasting, psychological operations, etc. That's important, but not enough: we need to think in terms of jointness, partnering through real dialogues and engagement with local partners at every step of the way. We need to organize ourselves as a government to promote a more integrated, smarter approach. But there are many activities which should not be directly done by the government. We should think about the British Council model, a largely independent entity which can build relationships and promote exchanges without being tasked with advancing specific U.S. policy objectives. Finally, Deputy Assistant Secretary of Defense for Support to Public Diplomacy Michael Doran (soon to be Assistant Secretary of State for International Information Programs Michael Doran, if he can get confirmed) offered four pillars for thinking about the problem from his vantage point as the coordinator for the counter-ideology mission in the Defense Department. Understand the environment. Public diplomacy in all its forms requires detailed understanding of how information flows in a given society, who is credible and influential, what resonates, how U.S. policies are actually being perceived - the sorts of things that a marketing firm would want to know. But nobody in the U.S. government, he argued, has the job of collecting that information and making it useful to policy-makers. Where is the line between intelligence analysis and audience analysis? He posed this as a tough bureaucratic problem, and I believe him since there are few people in the government better placed to know. He then argued that the information environment in the world had changed so dramatically since the Cold War that old models should be discarded. People are not waiting to be spoon-fed information, they actively seek out information... often information which confirms their own biases and beliefs. But we need to track this new kind of information flow and engage with it. Engaging people. He agreed with Lord and Amr on this basic pillar, and said that we do these traditional activities well and should have more resources. Empowering partners. Agreed again that the U.S. government might not be the right messenger to contest al-Qaeda's interpretation of sharia, so needs to find ways to support the efforts of those in the Muslim world who want to do so. Again, he pointed to the bureaucratic problem: whose job is it in the government to partner with them? We're not set up, he argued, to create third party networks who might not necessarily support U.S. policy but whose efforts help American interests - i.e. Islamic conservatives who argue against al-Qaeda even as they promote conservative views that Americans don't like. He repeatedly offered the "semi-hypothetical" example of an Iraqi film maker who wanted to produce a documentary about the horrors of Saddam Hussein's mass graves and disseminate it among European audiences. Whose job is it to give him a grant and help him get this useful message out? Countering the adversary. Not just al-Qaeda, but a whole range of adversaries. In the lively discussion which followed, I pushed the panelists on two points. First, everyone would probably agree that we should do everything but in a world of scarce resources - and getting scarcer - which should we choose? All seemed to agree that the problem wasn't getting more resources, it was about the distribution of the resources: the Pentagon would barely even notice the transfer of a few hundred million dollars which would revolutionize the State Department's programming capabilities. Second, what about the "Muslim Brotherhood problem" which Jim Glassman struggled with at GWU a few weeks ago? Nobody really wanted to engage with that one, though - Amr proposed a perfectly reasonable "violence" litmus test, while Doran turned it back as a tough policy quesiton not a public diplomacy question. 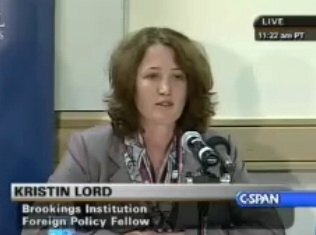 Read Kristin Lord's new report... and then don't commission or read any more reports. The surprising degree of overlap on the panel demonstrated that at this point we pretty much know what needs to be done. So do it. I agreed with Lord's Guantanamo suggestion, and pushed it further: a crisis will certainly hit early in the next President's term, and the suggestions about incorporating an understanding of the information environment and foreign attitudes into decision-making should be implemented immediately. In both cases, we'll be looking at a window of opportunity in which foreign publics will want to see if anything has changed... and that window will close quickly. Don't reduce everything to a 'war of ideas.' Al-Qaeda poses a significant challenge which must be countered, but a radical fringe ideology which is already broadly rejected by most Muslims hardly demands the total resources of the government of the United States. Public diplomacy should be part of a broader, long-term strategic engagement with the world. There was much more in the discussion, but hopefully this roundup gives a sense of what went on. Feel free to watch it on C-Span if you're interested in more! UPDATE: this event will be televised on C-Span live, for those who can't make it. Hady Amr, Director, Brookings Doha Center and Fellow, Saban Center for Middle East Policy at Brookings, and co-author (with Peter Singer) of Engaging the Muslim World: A Communication Strategy to Win the War of Ideas (Brookings, April 2007). 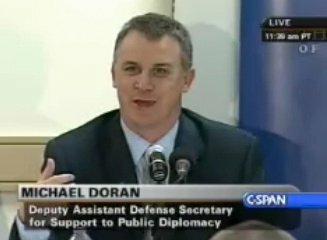 Dr. Michael Doran, Deputy Assistant Secretary of Defense for Support to Public Diplomacy, U.S. Department of Defense; 2007 testimony on the war of ideas available here. This morning I went to hear Under Secretary of State Jim Glassman and Ambassador Dell Dailey speak at GWU's Homeland Security Policy Institute on the topic of "Toward a Comprehensive Approach to Countering Terrorism." Glassman, who kindly pretends admits to being an Abu Aardvark reader, has been making the rounds the last few months laying out his new conception of the role of public diplomacy. His innovation has been in all but name to reorient public diplomacy efforts from "public diplomacy" towards "strategic communications" (thought he doesn't use precisely that language). On one level, I think this is a positive development - as I should, since I've been writing and giving talks for two years now arguing in favor of just such a 'war of ideas' focused tightly on 'delegitimizing terrorism' and leveraging al-Qaeda's very real marginality not just among Muslims but even among Islamists. Support for and opposition to al-Qaeda has very little to do with America's favorability ratings, and I'm glad that Glassman has severed that particular linkage. But I also think there is now a real risk of going too far in this direction. Global views of America matter for a whole range of important reasons besides the question of al-Qaeda and counter-terrorism. Subordinating America's public diplomacy to the single focus of "creating a hostile environment for violent extremism" is as mistaken as was the previous obsession with "moving the needle" on Pew surveys. The U.S. really needs to do both: a strategic communications campaign as part of the counter-terrorism effort, and a reconfigured and energized public diplomacy aimed at the longer-term, wider dimensions of America's relations with the world. The stunning imbalance of resources between 'traditional' public diplomacy and the State Department on the one hand, and strategic communications around the Pentagon on the other poses a real challenge. Both Secretary Gates (in speeches) and Under-Secretary Glassman (today) have acknowledged that there is problem, but I don't think it has been adequately debated. 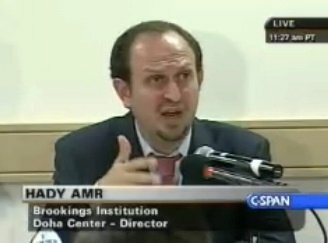 First, much of the discussion revolved around the Muslim Brotherhood question - how the U.S. should deal with influential Islamist groups which have renounced violence and are hostile to al-Qaeda, but which promote ideas antithetical to (his conception of) American values and preferences and oppose U.S. foreign policy. Glassman argued - in nigh Aardvarkian language - that given the primary focus on delegitimizing al-Qaeda, it makes sense to work with its most effective internal critics [* note - just realized this was poorly phrased - the MB is not an 'internal critic' of al-Qaeda, but rather an influential voice within Islamism.. an important distinction which that sentence didn't make as obvious as it should have]. But he also expressed his concern about the longer-term challenge of a group like the MB, who hurt al-Qaeda but also challenge the emergence of the kinds of pro-Western, secular "moderates" that the U.S. wants to see. He repeatedly described the Muslim Brotherhood question as one of the toughest facing his office, and one which they were actively discussing but had not yet arrived at any clear strategic vision. I can attest to both points - that the issue is under real discussion, and that there is no clear strategic consensus as of yet. It might help to define the objective first: if the goal is to sideline al-Qaeda, the Muslim Brotherhood is a useful indirect ally and if you are trying to build a secular society it isn't... so which war is the U.S. trying to fight? On a side note, Glassman also noted his fascination with the "Muslim Brotherhood bloggers" phenomenon, but didn't quite know what to make of it. Second, Glassman talked with some passion about using new media technologies to "divert" young people away from radicalism, explicitly arguing that youth should be channeled into other areas such as music, sports, and entertainment as an alternative to politics and religion. It's not every day that you hear Frankfurt School critical theory - popular culture as an instrument of state power used to distract the people from politics - articulated as policy. Arab political commentators such as Fahmy Howeydi and Abd al-Bari Atwan have long complained that popular music video clips and reality TV shows were designed to distract Arabs from political issues... maybe somebody was listening, if not exactly who they had in mind! Finally, there is a real tension in their presentations in the portrait of al-Qaeda. On the one hand, they presented al-Qaeda as a "death cult", "imploding" under its own contradictions, with an ideology that "doesn't resonate with most Muslims" and carrying within it "the seeds of its own destruction". They gave much attention to Peter Bergen's account of AQ's fatal flaws, of the declining support for suicide bombing, the recantations by Dr Fadl, and the rest of this new narrative. But at the same time, they presented AQ as continuing to be an adaptive and dangerous organization, a propaganda juggernaut posing a continuing massive threat and with frightening abilities to recruit and radicalize. But which is it? Do they really see al-Qaeda as a marginal, self-defeating movement collapsing on its own irrelevancy, or as a major threat requiring the concentrated resources of the U.S. national security establishment? Does it really make sense to focus the American 'war of ideas' on such a self-defeating, collapsing death cult? This reminds me of nothing more than Jack Snyder's famous depiction of the 'paper tiger' myth, in which adversaries are simultaneously seen as so formidable that they pose an existential threat and as so weak that they can be easily crumpled by a forceful blow. More debate fodder. All of which makes me think that what the world needs now is a roundtable on the challenges for public diplomacy and the 'war of ideas' for the next administration... have to get on that. Military Review: "Partnering with the Iraqi media"
The current issue of Military Review (via SWJ) contains a quite fascinating article written by Lt Col Frank DeCarvalho, Major Spring Kivett, and Captain Matthew Lindsey entitled "Reaching Out: Partnering with Iraq Media." The article enthusiastically details the efforts of Task Force Marne to use Iraqi media as a more credible source for pro-coalition stories. An Iraqi face on the coalition's stories, they argue, offers a more effective way of influencing Iraqi attitudes than traditional PSYOP techniques: "using native news reporters will increase chances of acceptance by the Iraqi population by relaying credible stories of progress that can resonate favorably through communities." It's worth a look. The authors explain that traditional PSYOP methods such leaflets, posters, handbills and radio broadcasts are inadequate to the task of influencing Iraqi attitudes: "Iraqi citizens know the information's origin and often question its legitimacy, credibility, and intent." After a while, they point out, "the inherently manipulative PSYOP process... reaches a point of diminishing returns. Inducement requires not just a persuasive message but also a credible source." Backing away from the "inherently manipulative PSYOP process" does not seem to be an option, given that "influencing Iraqis is central to managing a favorable outcome in this war". Instead, this led to an effort to find a more credible source: the Iraqi media. They found such a credible source in the Iraqi media, they explain, as Task Force Marne "established an Iraqi media section (IMS) to capitalize on Iraqi media capabilities and the advantages of using them." The IMS began with media monitoring functions, and then "expanded its mission to include developing, translating, and disseminating coalition-related stories to Iraqi media outlets." As of today, it has "contacts with 11 television stations, 27 newspaper outlets, and a host of media websites." IMS also has an exclusive contract with Iraqi government's newspaper al-Sabah, and the article offers a lengthy vignette of a program it orchestrated for the government TV station al-Iraqiya. All told, IMS has "conducted 38 battlefield circulations with Iraqi media crews, and it has translated over 300 'good news' stories into Arabic and disseminated them." While the authors stress repeatedly that their efforts are exclusively public affairs, they acknowledge that the IMS does not work for the Public Affairs office, with its mandate of informing: "instead, it falls under the direction and oversight of the effects coordinator" (i.e. the unit which handles PSYOP and influence operations). The authors insist that this is not significant and that the IMS plays only a public affairs "informational" role - which would be odd, given everything else claimed for the program, but is duly noted. Nevertheless, the stories and their placement are carefully coordinated with the "effects" officers, tightly interwoven with the strategic communications plan, and then their distribution used in part to improve the feedback loop on PSYOP development. The benefit of this, as they write repeatedly, is "putting an Iraqi face on the story; an Iraqi reporter talking to fellow Iraqis has a much greater effect on the Iraqi psyche than if a coalition reporter told the story." This has worked so well that "the IMS is currently considering hiring independent Iraqi correspondents and developing a sustainable network of informed journalists." Overall, the authors urge that the coalition develop more ways to "support and use the Iraqi media." Quite interesting. Some might remember the scandal which erupted back in late 2005 when the Lincoln Group's efforts to pay Iraqi newspapers to run pro-US stories was exposed. This isn't quite that, in that the essay claims that the articles are published with full Task Force Marne attribution - though I'd like to know whether that "produced by Task Force Marne" disclaimer is used as universally as claimed. But it is a sustained effort to place US military-produced "good news stories" in the Iraqi media, which falls under the jurisdiction of "effects" and not "public affairs", and which is explicitly cultivating the Iraqi media as a more credible face for its strategic communication efforts. This should not surprise anyone who follows the information war dimensions of counter-insurgency doctrine, or read various published accounts of specific IO operations in Iraq, but it might provoke some useful discussion. There always seems to be a deep tension between strategic communications and traditional public diplomacy on questions like this, which will likely shape reactions to the Military Review story. Some might respond that since the insurgency uses the media as a "force multiplier", so must the counter-insurgents. Others might argue that there is something inherently objectionable about this kind of use of "independent media" for strategic ends, no matter how overt. Yet others might note similarities to the administration's efforts to shape coverage in the American media. Some specific questions about this case come to mind. Did the architects of these efforts consider that their efforts might discredit the Iraqi media over time, or that using the media to strategic effect might somehow compromise the independence and freedom of the Iraqi media? Does the disclosure that the IMS has translated and disseminated more than 300 'good news stories' force us to re-evaluate the credibility of "good news stories" published over the last few years in the Iraqi media? Finally, there's the issue of 'blowback' (when propaganda produced for foreign audiences is recirculated inside the United States). Maj Gen Rick Lynch explains that "targeting the American audience is a PA responsibility, and targeting the Iraqi audience is an effects responsibility." What happens when the disseminated good news report is picked up out of the Iraqi media source, tranlated - perhaps without that "produced by TFM" label - and then becomes the basis for American reporting? Matt Armstrong, Steve Corman, Andrew Exum, and others no doubt have some thoughts on the matter. Two major investigations into al-Hurra dropped yesterday, the first by CBS News/Pro Publica (airing on 60 Minutes) and the other by Craig Whitlock of the Washington Post (with part 2 slated for tomorrow). Both delved nicely into the deep, structural problems with the station, making a number of points which I've raised over the last few years. Both got some important and insightful people to speak on the record, and Pro Publica has posted some relevant documents on its website. Since the Pro Publica site includes several links to Abu Aardvark, I suppose I should note that I did not get the chance to talk to them before they went to air. Both pieces are far better than the witch-hunt led by the Wall Street Journal against Larry Register last year, though I thought Pro Publica fell into the trap of sensationalism by hyping some alleged anti-Israeli remarks that ran on al-Hurra recently - which might attract ratings while distracting from the bigger issues which they effectively raised. I'm not going to get into the substantive issues they raise about the station's management (or lack thereof), content, or conception since I've said my piece on these issues many times and haven't got anything new to add. Instead, I'll just recommend both for those interested in public diplomacy.